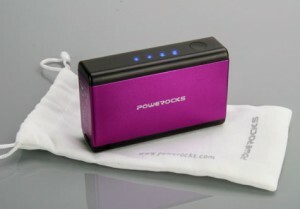 Power on the Go — Peace of Mind in a sack! Our inventory of battery operated, USB charged, personal devices grows longer and longer. This situation translates into a greater likelihood of finding one of these running out of power at a critical moment. This could prevent you from keeping the kids entertained on a long trip or from getting that message from your spouse to pick up a gallon of milk on the way home from work. My wife uses her iPad as a Point of Sale device when she sells her art work at art fairs. Sooner or later we will forget to recharge the iPad overnight in the hotel room. If she cannot process charge card sales it means lost income and an unhappy household. This is how the Powerocks Magic Cube provides me with peace of mind. The Powerocks Magic Cube 6000mAh Extended Battery has a footprint just smaller than a standard business card and it weighs in at 5.3 ounces. The included storage sack is white. Some potential users would say that is a disadvantage as it will tend to get dirty faster, but I like to think of it as a plus. The light color of the sack will be easier to find in the dark interior of a computer or camera bag. When you need this little guy you want to locate it fast. In my testing a fully charged Magic Cube was able to fill the tank of a nearly empty iPhone 4 in just over two hours. I estimate that the Magic Cube holds enough juice to power up an iPhone about three times. I was finally able to get my wife to relinquish her iPad with less than a 10% power charge to test the purple Powerocks’ ability to charge it up. 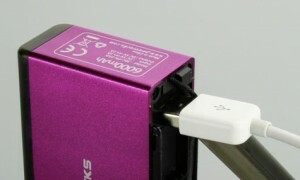 In about three hours the Magic Cube was able to pump the 6000mAh into the iPad and bring the charge up to 45%. To get the power in or out of the Powerocks Magic Cube one must pop the tethered plastic end cap off to reveal the plugs and jacks. 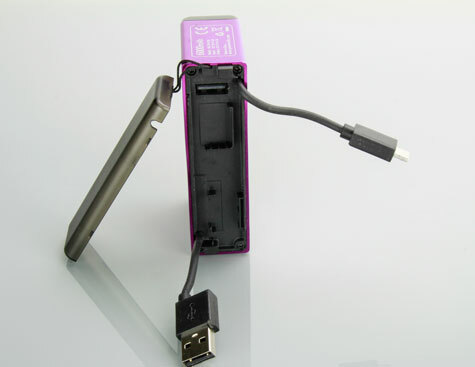 The built in USB and micro USB cables will get the electrons to flow into the battery and the USB jack allows the power to flow out to your device. The Powerocks Magic Cube will definitely reduce my stress level during those out of town art fairs and other trips but this product is not perfect. The plastic tethered cover is held on by a thread and feels a little delicate. The built in USB cables fit nicely under the cover but the cords are so short as to make recharging sometimes inconvenient without bringing a USB to USB extension cable along as an additional piece. I have never been able to plug a USB cable in upside down before, but I can do it with this unit. With the layout of the contacts and the fact that it doesn’t seat all the way in there is no danger to the battery or the unit being charged. I didn’t notice it until I looked at my iPhone and it showed that it was not charging. This could lead to a very frustrated gadget user. The recharge time is the biggest disappointment. Using a 10w AC power adaptor rated for use with an iPad takes between six and eight hours to recharge the 6000mAh Magic Cube. I would have hoped for about half the time or twice the power. Speaking of twice the power the Magic Cube comes in various capacities, you will be able to find one that fits your needs. 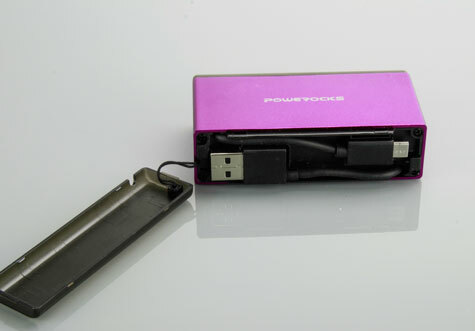 The 6000mAh is the Baby Bear in the Magic Cube family. If you shop for a Powerocks Magic Cube on Amazon be sure to check all the colors. For reasons that I don’t understand Amazon discounts individual colors to different levels. For example, as I write this the pink one is $47.33 and the silver one is list price at $74.99. If you feel it must match your silver BMW you will need to pay more for that privilege. Is Apple Heading for Another Big Fall?